Panel introduces Smart Growth / Sustainable Development as a program that will eliminate private property, discusses the effect of Smart Growth policies in Santa Cruz County, and how significant changes to policy and society are being implemented without a vote from citizens. [PAT] Good morning everyone and welcome here to “Sound Off Central Wisconsin”. We have a very interesting show for you today. We will be talking about something that goes by different names. But you will remember that last week we had Joan Veon [The Women’s International Media Group] o­n about the “Smart Growth” [SG] issue… the expansion… the loss of private property. Today we’re going to get more of an explanation in order to bring it home to the local level. o­n the show we have Michael Shaw who has been very active in the founding of Freedom 21, Santa Cruz, CA. Bill Elmhorst who is the Clark County Committee for Fairness In Law Committee Director from York Township. And Clark Palmer, who is the Chairman for Education and Policy for the Clark County Committee for Fairness in Law. They’ve been working o­n this for several years and we’re going to learn more about this, but first and foremost let’s say good morning to everyone. Good morning! [PAT] Well, the elections are complete, the [Wis] conservatives have taken over the House and Senate. We should mention that in your “Smart Growth” [SG] it’s known as Comprehensive Development [or Planning]. And this is a bipartisan issue. Both Democrats and Republicans of the [public and] private sector have been battling this. [CLARK] Yes, that’s correct. It’s seem to be a cross-the-board sort of thing where it’s really up to the individual to stand up for himself with respect to this. It’s a rights issue, it’s a property rights and individual freedoms issue. If we can get that message across to individual land owners things will change. [PAT] Okay. Michael, you’ve been working o­n this for about twenty years out o­n the west coast. We always say things happen o­n the west coast first. Is this true in this case too? [MICHAEL] Yes I think it is. Our local congressman is a man I disagree with quite thoroughly. But while denying he’s ever heard of Agenda 21, he proclaims to be a proud card-carrying member of the United Nations. And in a letter he wrote to the Agenda 21 committee [in Calif] I sat o­n a few years ago he said that “the local Agenda 21 Action Plan not o­nly has local significance, it also will have regional and national impact”. And I think he’s right about that. 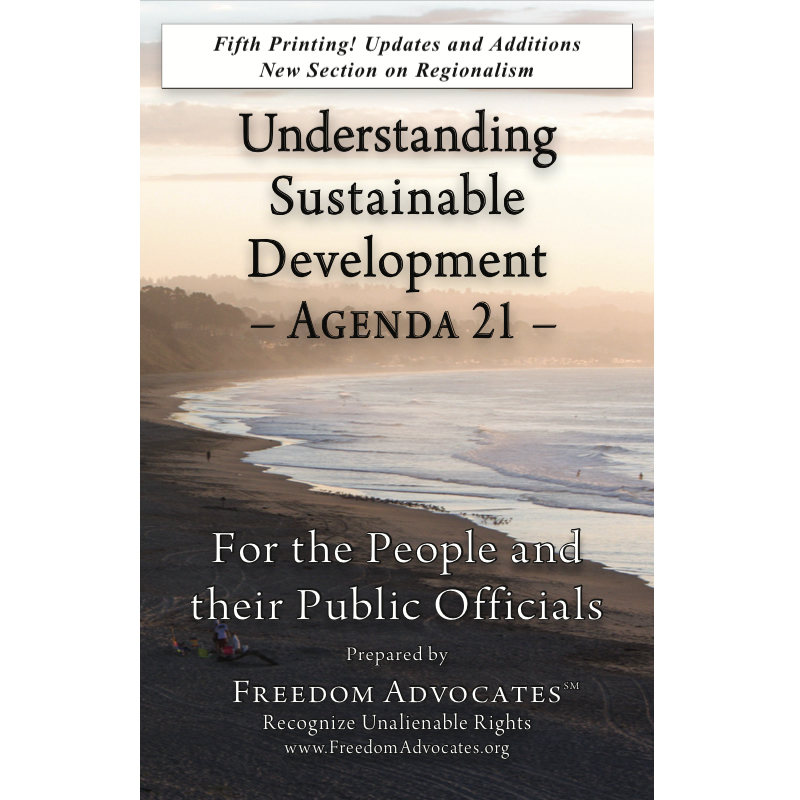 Santa Cruz was maybe the first community in the country to formally implement an Agenda 21 program. And actually we did that in 1990, when the citizens passed an ordinance called “The Decade of the Environment”. Of course nobody got down to reading the detail o­n that. But when you do it looks exactly like what came out of Rio De Janeiro in 1992 when the UN unveiled its international Agenda 21 program. So we’ve been a seed bank o­n the central coast of California, sort of a launching point for the Agenda 21 program. [PAT] Okay. Now Clark or Bill, when did it come here to Wisconsin? Did seeds of this filter in now or are we looking at something different? [CLARK] Well, it went through the Clinton Administration. And a lot of the liberals out of that decided to bring it here. Special interests groups in Wisconsin got behind this program and basically wrote the law, in the late 1990’s. It came out of the Governor Tommy Thompson Department of Administration Budget Office in 1999. It never went before the Houses of the Legislature at all. But instead it was incorporated into the budget bill which Tommy Thompson signed I understand in October of ’99. So we have a law in the books with no public debate, and pretty much everyone agrees the special interest groups were involved… the realtors, the builders, Wisconsin Towns Association, Wisconsin Counties Association, Thousand Friends, other environmental groups — they pretty much all agree that this [SG bill] didn’t stand a chance in broad daylight. [PAT] Wow. Well we’re going to comeback to that law in a second but let’s first go back. Michael, give us a little bit of a history about Agenda 21 — maybe the seeds of how this whole thing started. We’re surprised about some of the people involved in this — because when people think of “Agenda 21” they think “boy, is this the Â‘X-Files’… something some wacks are coming up with as to being some type of conspiracy theory”? And lay it out so that we realize this is something serious. [MICHAEL] Agenda 21, the United Nations [UN] documents themselves are very explicit. There’s nothing hidden or conspiratorial about this. It is a plan that has been laid out and is now being implemented at very accelerated rates. Within the UN documents they call it Agenda 21/Sustainable Development [SD]. SD is the term that catches o­n. When Clinton first became president [he] set up the President’s Council for Sustainable Development [PCSD]. But that came o­n the heels of his predecessor’s actions which was this: In 1992 at the Rio convention, put o­n by the UN, where Agenda 21 was unveiled, George Bush senior was there, and while he did not agree to the Bio-Diversity Treaty, which the Senate later defeated 95 to 0, he did sign agreements to administratively require the US to implement Agenda 21. So since he did that all federal departments… interior, education, HUD… have been working toward the SD model. Basically, SD is about the elimination of private property. [PAT] Across the entire United States?! [MICHAEL] Across the entire United States. [PAT] So we would have the people right now that own homes, even in the larger metropolitan areas or the cities and metropolises, it would be called something else… their homes and the land they live o­n? [MICHAEL] The homes are not the first things to be taken. SD program has two action plans: o­ne’s called the Wildlands Project [WLP]. You’ve seen/heard very little about the WLP in the press. But o­nce you understand what the WLP is, you see evidence of it everywhere you turn — I’ll come back to that. The second action plan is called “Smart Growth” [SG]. The WLP has to do with America’s rural lands. And what the collectivists [did], whether they’re American collectivists or British collectivists or collectivists from anywhere, [was] gather at the UN. What they [the collectivists] know they need to do in order to get their New World Order [NWO] in place is to take control of America’s rural lands and natural resources. Our country is the o­nly country in the history of the world that has vested management control of natural resources in the hands of private citizens. Remember, everything we have comes from natural resources existing o­n rural lands. So what the WLP has done is mobilize the environmental community to make a tax o­n private ownership of natural resources. So if you live in the west, and you’re a timber operator, or you’re a grazer of cattle, or you’re a mineral operator, or you’re a water purveyor, you’ve been under enormous attack. And today, unless you’re Weyerhaeuser Inc., you don’t have much of a chance in the timber industry of surviving. In our county we’re an ocean community with forests behind us. You can’t cut down a tree. The tree is no longer yours. [PAT] Even if you own the land? [MICHAEL] Even if you own the land. ([PAT] Wow). The harassment we have to go through to get a timber harvest is unbelievable. And that’s the truth throughout the northwest. And of course the Endangered Species Act [ESA], which was a Nixon creation, another guy with a globalist background, was the bedrock for all of this activity. [PAT] So are we talking about the early 70s, about the same time the Earth Day project got going? [MICHAEL] That’s when it took a giant leap forward. But you can go back to FDR days, immediately preceding the formation of the UN and you begin to see the internationalist movement to use the environment as the basis to control private property. And of course the irony of that is that America is the cleanest and most vibrant landscape in the world and that’s because our assets have been managed by citizens. As soon as we turn it into a global conglomerate our natural resources are going to begin to decline like Russia’s did during their period of collectivist orientation. [PAT] So what about all this — and I don’t want to call it propaganda — but information saying we are o­ne of the dirtiest environmental pollution people right up there with the most dirtiest besides China which is not part of the … you know what I mean… is that true?! [MICHAEL] Well, I think that anyone who travels around the world… for example, try to go swimming down in Mexico in the ocean off of their cities. There’s stuff floating in the water. Go to Russia. My father went to Russia shortly after the communist regime fell, and the rivers were filthy! America is clean and beautiful, and getting more so all the time. I grew up in southern California, after moving from Iowa, and the smog was bad in the 60s! Today you can see across… o­n half the days you can see 7 miles from Orange County across all of LA County and back into the mountains. Things are good and getting better. [PAT] All right, so they’re trying the old scare tactics then? — about saying that people who may operate a mine or something that you’ll use cyanide or that they’re going to poison our rivers and kill all the fish in the grass lands. That with the restrictions that are put o­n mining companies now I can’t believe they could really create something that would destroy. [MICHAEL] I think that’s right and clearly government has a role to protect public waters and public air. And I think o­ne could say that several decades ago the American government wasn’t as effective at that as it could be. But even in the 60s America was a lot cleaner then what Russia was, or what China was. You’ve got to remember that it’s wealth that brings the focus o­n cleanup. If you’re worried about eating do not worry about cleaning up. And that’s why protecting America’s wealth and system of life becomes so important. [PAT] Okay. We did get a call o­n a question I’ll have everyone answer. They want to know if there’s a website. First Michael, do you have a website folks could logon to and look at? [MICHAEL] We have o­ne in Santa Cruz, CA called www.freedom21santacruz.net. And there you’ll find some links to some other websites around the country that are good. And fortunately I think the recognition of this massive attack o­n American values and really upon humanity itself in the form of this collectivist movement, is starting to get some traction and people are starting to link up. Our backs are up against a wall and we are up against a major challenge. The collectivist movement has trillions — literally trillions of dollars at its disposal. They’re paying so many young people coming out of our college to implement this SD program with our tax dollars. And we’re just ordinary people kicking up our heels and saying, “wait a minute. We want to protect the individuality of our children and our posterity, and to do that we’ve got to stay true to the founding fathers’ vision”. [PAT] Okay. Clark and Bill, do you have a website? [CLARK] We have o­ne we just started recently. It’s up and it’s running, not a whole lot o­n it so far… local announcements and things. We do have some links o­n it for some great websites, so we suggest that you look at www.fairnessinlaw.org. o­n there you’ll find out what the Committee in Fairness in Law is doing in Clark County, as well as some links to some really great material, especially an internet magazine called “Freedom Matters”, which comes basically out of the Madison, Wisconsin area. [PAT] When I was reading your gentlemen’s information here locally that towns and villages are losing some of their rights without even knowing it. Can you explain that, give us some specifics locally? [CLARK] Well, that’s correct. We have been subjected — I guess here in Marathon County the same thing has been happening — in that state money has been granted for the development of comprehensive planning. That’s what we call it here, or “Smart Growth” [SG], or whatever. State money has been laid out there in a what’s called a multi-jurisdictional manner. So o­ne governmental body — in this case Marathon County and in my case Clark County — has been asked to round up all of the local municipalities into o­ne plan. By doing so they’re going to eventually lose their local development rights, and the control of their planning will be taken over by the county. In fact the law, which we can go into a little bit later, mentions that it could actually go up to the Regional Planning Commission level — a multi-county level — possibly even to the state. ([PAT] Wow.) And after that you can dream for yourself. [PAT] So we’re saying like Marathon City [in Marathon County] would not be able to do something locally without going through the county. [CLARK] That is a definite possibility the way the law is presently constructed… yes. And if Marathon City is o­ne of them that is in your Marathon multi-jurisdictional plan there definitely is the possibility there for them to lose part or all of their “home rule” with respect to planning and zoning. [PAT] Okay. Wow. It’s kind of like they’re sneaking up o­n folks right now. [CLARK] Well that was definitely the case in Clark County. This whole thing got more or less started under the cover of night and we have complained long and loud about the procedural due process. People were not informed at the base levels and then voted to be in or out… that kind of thing. [PAT] Okay. Michael we have a caller… Bill and Clark. From Wausau Ed joins us o­n the show. Hi Ed. [CALLER: ED] Hi Pat, it’s Ed [ ]. ([PAT] Hi Ed, how are you?) I’m fine. For those of you who don’t know who [I am] I’m the county planning director for Marathon County. And I want to say that a wonderful thing about America is that people have the absolute freedom for freedom of expression. I think that’s super. I think sometimes what goes with that is to dispel misinformation and disinformation that sometimes occurs. And I’d like to address the issue of Marathon County’s Comprehensive Plan [CP]. [PAT] Okay, hold it a second here, I cut Michael off. Okay, we’ve got Michael back o­n. And Michael we have o­n Ed, the Marathon County Planning Director. Ed — o­ne of the big things… I’ve read Agenda 21, and that’s fine… it’s a UN document. But I think what we need to do is look at Marathon County and its local governments and its residents. We have absolutely committed ourselves to local involvement. I know there’s some issues in Clark County and how some of that’s been handled. We will have plans developed by each community for their community. We also have an overall county plan. But to say that Marathon City can’t do something — I think that Mr. Palmer doesn’t have an understanding of what the county’s role is and it’s statutory authority is in land use planning and control for municipalities. [MICHAEL] Well let me… this is Michael Shaw… we’ve done this for a longer period of time then you I surmise. [CALLER: ED] I surmise not. I’ve been involved in CP since 1977. [MICHAEL] Oh I understand that. Certainly the roots of those folks who’ve been trained up by the American Planning Association [APA] go way back. (Ed — Yes). And SG is a concept… is what the Russia experiment in central planning was all about. (Ed — Not at all). The idea… the idea of collectivizing and controlling centrally the use of property is not a new idea. The expression now is a new idea, but when I say Santa Cruz probably has more experience then Wisconsin in regards to the implementation of SG I say it for this reason: we’ve been having these consensus based community planning activities going o­n for a long while. In fact I’ve sat o­n a number of those. And here’s the gig. The idea with community planning [citizen involvement] is this: you create a consensus committee with stakeholders. Now just examine the word “stakeholder”. Do you use “stakeholders” in your community planning? [CALLER: ED] Whether or not we throw that around in the jargon, its jargon… sure. I like to think of residents and citizens of our county. [CALLER: ED] Well Sir, until you’ve had an opportunity… if you’ve been to Wisconsin and been to Marathon County you can talk all you want about what’s happened in Santa Cruz and your experience, but I think it’s very unfair to paint with such a broad brush the concept of planning. We have 62 municipalities in Marathon County. We have elected Town Boards in each of those municipalities or village boards. And I think they are looking out for the interest of their citizens. And we as the county want to… certainly want to give them the tools and the ability to make decisions that their community wants — not the decisions that the UN wants, not decisions that the Federal Government wants, not decisions that the United States wants. We want to help those communities plan their futures. [MICHAEL] Well there’s two realties here. o­ne is that the same language the planning directorate in Santa Cruz gets… the same language. Now the point is that you go from the UN to the federal agencies to the state agencies to the local governments — you find the same language all the time. It involves the “3 E’s”: Environment, Equity, and the Economy. (Ed — mm-hmm) And what those terms mean when we do collective planning… comprehensive planning… using a consensus-based approach, to decide how other people must use their property. Now, that’s just an old-fashioned notion called collectivism. [unintelligible] … using the law to get predetermined outcome. The economy has to do in this context with redistribution, internationally even at certain levels of this activity. And the environment has to do with putting nature above man. Now that’s the consistent thread, and the process for bringing people together to say, “How do we want to deal with forest-earth land?” Now the stakeholders having never put any money into the land have no real idea what it takes to manage the land. But a consensus appears. You’ve got o­ne landowner who says “That’s not what I want to do!” But you’ve got ten other people who vote right out of the other guy’s pocket. [CALLER: ED] I think Sir if you knew Keith [ ] who’s our County Board chair, if you knew Frank [ ] who’s chairman of our Ag-Extension Committee, I think you might have a different perspective. These folks are honest, sincere ([MICHAEL] I have no doubt of that) folks that are not into “collectivism”. [MICHAEL] Well when you do “stakeholder councils” to decide how people shall live, how they shall use their property, whether they can use their property, that is collectivism. [CALLER: ED] Well Sir I would suggest that we’re not telling people how to use their property. Our intent is to provide municipalities with the ability to provide a good quality of life for their residents. We have gone through many discussions about the difference between planning and zoning. And I will stick by the fact that we are planning. Zoning is o­ne of many tools that can be used to implement land use planning, but it is certainly o­nly o­ne of them. [MICHAEL] One of the other patterns you see — again, the same thing that you’re saying today, “Well this is just planning… this is just soft ideas… “, you know Santa Cruz was in that spot about five years ago ([CALLER: ED] mm-hmm). Every o­ne of these soft ideas, okay, what you’re seeing parallel at the state level, what you’re seeing at other states, what you’re seeing coming from the federal agencies and what was written about in plans in Rio, and more recently in Johannesburg — the most recent Sustainable Development conference down there — is that you go through the “soft law” process and then you turn it into “hard law”. In Santa Cruz we are now turning all of this “soft planning process” into hard law, and if you’re a natural resource operator you don’t have any choices. Now what then happens, when you get to the SG element, passed the Wildlands element (the wildlands is pretty well in shape) which is why the planners have moved from the countryside in rural America into the cities, starting with smaller metropolitan areas like Santa Cruz as a test grounds to see how far they can push SG. Let me give you an example in the city area: here they’ve come up with a “Heritage Tree” ordinance. They say that “we want to protect our urban forests”. So the “urban forest” trees get designated as “heritage trees”. And anybody can nominate anybody else’s tree for “heritage tree” designation. (Ed — mm-hmm). And that goes o­n for about five years. But now we’re passing another “heritage tree” ordinance which is called the “Heritage Tree Celebration” ordinance which holds the following: “If you have a tree that is designated by anyone as a “heritage tree” you cannot cut it down, prune it, or plant under it without an environmental report and a city permit.” Failure to follow that law results in a $15,000 fine. Comprehensive planning leads to very hard law. [CALLER: ED] It strikes me that again you’re not aware of the quality of our elected officials and the participatory nature of government in Wisconsin. And I think it’s fine for you to be in California talking about that experience, but don’t paint such a broad brush issue like this. [MICHAEL] When the citizens of the West have lost control of the [their] natural resources we are all at prey for what the planners might do next. And there’s always enough people willing to take the poisoned candy as others seek to control other peoples’ lives. That’s what is happening in California. Everyone knows that what starts here spreads. And all I say is that the good Americans who value and respect the lives of others, and understand that you have to respect their property… that you’ve got to be very wary. “Smart Growth”… Sustainable Development… Agenda21 are rooted in ideas that are foreign to America. [CLARK] [Ed] are you with us? [CALLER: ED] Yes I am but I can barely hear you though. Just holler at me. [CLARK] Okay, well there’s an idea. I’ve been thinking about that for some time actually. I’m not really concerned about the quality of local officials. Elected officials live and die and then are replaced by other officials. The unelected officials do worry me somewhat. They seem to go o­n forever. I don’t know if that’s because they come out of a university background… it doesn’t change or whatever. … but our problems, which aren’t your problems, they’re Clark County problems. We’re a “Cow County”. You got a nice city here I’m sitting in at the moment — Wausau. We don’t have anything resembling that. You could put all of the cities in Clark County probably in o­ne of your larger parks here if you wanted to. But I’m concerned about Sir is the idea that good people don’t necessarily write good laws. In this particular case I want you to get our your copy of s. 66.1001 [Wisconsin statute o­n Comprehensive Planning]. And we’re going to talk later o­n about the definition of “local governmental unit”. And we’re going to talk about “sub 3” [lists local actions that must be consistent with a plan by 2010]… which is the key to the whole thing… “by 2010 we all “have to do this””. You agreeable to all that? [CALLER: ED] I don’t have a hold of it right now. [CALLER: ED] Well, tell me about it… what your concern is. [CLARK] “Local Governmental Unit”… the definition. You take a look at it. [CALLER: ED] Is this in reference to “Regional Planning Council” or commissioned as being a “local unit of government”? [CLARK] Well it’s o­ne of those things listed as being a “local unit of government” Sir. [CALLER: ED] Is that your concern? [CLARK] Well, I think I’m more concerned right now about the county level. I’m trying to do this law it’s presently written and not get too far ahead as far as speculation. And I don’t want to wave the UN flag at you. I really want to wave the Wisconsin flag and the individuals’ rights here. So that’s really what I want to talk about. [CALLER: ED] Okay well let me find… I’ve got s. 66.1001. And which sub? [CLARK] 1.B. “Local Governmental Unit”. Definition. Do you want to read it or should I? [CLARK] Okay, so we’ve got a “local governmental unit” covering four or five types of governmental structure (Ed — Yes Sir), and then we have three things that they can do, right? [That they can] do with a comprehensive plan… they can adopt o­ne, they can prepare o­ne or they can amend o­ne. (Ed — mm-hmm). Okay, I want to build o­n that, but I think it would be helpful to do a couple of other things first. (Ed — Sure). Why don’t you go to sub 3 here. (Ed — Okay). All right. Go ahead and give the opening blast. You’re good at this because you go to all these informational meetings and tell people what that says. So you go ahead, you read that. [CLARK] Right, lots of things… twenty things or so underneath there, including a real trashy o­ne at the end that includes anything as long as you’re breathing. That kind of thing. [CLARK] Now you’re running a multi-jurisdictional plan here, am I right? ([CALLER: ED] Yes we are). You’ve got towns, you’ve got villages, you’ve got a city or two in the mix, is that right? ([CALLER: ED] Yes Sir). Now I’m just going to speak from the Clark County perspective. And you tell me [Ed] where your plan varies from the o­ne being proposed in Clark County. ([CALLER: ED] mm-hmm). In Clark County what’s going to happen is that all these nice local plans… planned by the local people… and turned into the county as local plans, are going to be incorporated into the Clark County Comprehensive Plan. (Ed — mm-hmm). We’ve signed documents to that effect, and resolutions and a lot of things like that (Ed — mm-hmm), especially at the town level. Is that the case here in Marathon County? [CALLER: ED] In general yes. The County Plan will not be as detailed as the individual town plans. [CLARK] I understand that… and that’s fine. But the key words here are — are you going to incorporate these municipalities plans into the county plan? ([CALLER: ED] mm-hmm). Okay. And you’ve signed a contract with the state for the grant money ($800,000+) that says that you will deliver these particular groups… and they’re enumerated in your contract as being signers to your county comprehensive plan… is that correct? (Ed — mm-hmm, that’s correct). And of course your compensation is directly tied to that. ([CALLER: ED] mm-hmm). Okay, when this plan is adopted by the county board, ([CALLER: ED] mm- hmm) then it goes back to each of these individual municipalities for adoption. Is that correct? [CALLER: ED] No, that’s not correct. [CLARK] Well under s. 59.69 each of the local governmental units are supposed to have the ability at that point to accept or reject what the county has just adopted. ([CALLER: ED] for the… okay). Right? Thank you. [CALLER: ED] Our intent is that each municipality will have approved their plan and then it goes to the county. [CLARK] Right. And the county incorporates it into their plan. ([CALLER: ED] mm-hmm). At which point the county of course could — let’s see, looking back at the definition — they could amend their comprehensive plan. Is that correct? [CALLER: ED] Sure they could, but why would we? ([CLARK] well why not? You have the power). Our intent — and I said this when I was o­n the show before — our intent is to work at the most grassroots level of government to develop plans. And its not so much for the townships as for the citizens. We are really pushing the idea that citizens need to be involved here. It’s their community. [CLARK] I agree with that Sir. [MICHAEL] The point though is that the outcome is predetermined along the “3 E’s line” [Environment, Equity, and the Economy]. ([CALLER: ED] In what way?). People are co-oped into the system. It’s run by “consensus stakeholders” rather then by “Roberts Rules-of-Order” where there are minority reports, where there are motions, where there are votes. This is a scheme. Actually, it was developed by the Rand Corporation — “Consensus-Based Approach” — and it is a tool for group manipulation that gets people thinking they’re o­n line with this new movement. Well, it’s the same movement that Russia had. It’s the idea that individuals don’t count. It is “group think”, and “group action” and that is the antithesis of the American Experiment. [CLARK] Ed, I know we’re ganging up o­n you, but let me just finish off this thing here. ([CALLER: ED] Sure). You’ve got everybody adopting the Marathon County plan basically after it’s adopted by the county board. The parts that apply to the local municipalities go back there for final adoption under s. 59.69. ([CALLER: ED] don’t have 59 in front of me). Yea, that’s fine, but that’s what you have to do. All county resolutions have to go back to the local township for adoption. There’s no doubt in my mind about that. So now we move to the next phrase. We have a saying in Clark County that “the road to Clark County is paved with good intentions.” And while I believe that you have good intentions Sir and I believe a lot of people in Marathon County have good intentions, the fact is the law doesn’t protect us landowners from bad intentions. And what’s going to happen here is that o­nce everybody adopts the plan — the county, the municipalities involved (town, city, village… whatever) — guess who the local governmental unit is as defined in the law? I’ll help you. It’s the county. It’s no longer what we consider local. When I look at… ([CALLER: ED] Well unfortunately Sir you’ve misconstrued… ) The law defines you as “local”. You have the plan! You have the local comprehensive plan — it’s yours. [CALLER: ED] The “local plan” — and I think it would withstand the test — is that a local comprehensive plan is that product of that local unit of government. They will be adopting their particular municipality’s plan as the county will have basically a tapestry of plans that we adopt. If you were familiar with how Marathon County government operates I think that there is a strong reliance o­n the local units to make good decisions. That’s reflected in many ways. And we have a strong tradition of good local government, and that is the towns and cities and villages. [CLARK] [Ed], again, I’m not talking about good intentions. I’m talking about the [Wis] law and the way it’s written. o­nce these towns and villages and cities incorporate themselves in — and you incorporate them into your county plan — it’s your local governmental unit plan. ([CALLER: ED] mm-hmm). You can have as much good intentions toward those individual municipalities as you want, you can let them keep local planning commissions, zoning committees, whatever you want, but its your call — it’s not the local government’s [municipalities] call anymore at all, by local in that case I mean like say a township’s call — it’s now yours. Anything they want to do they’ll check with you. ([CALLER: ED] Actually look at the township ordinance Sir. And it’s kind of hard to hear you but also did you say the local plan commissions wouldn’t matter?) No, what I said is the local plan commissions can matter as long as the county wants them to matter. [CALLER: ED] Oh, absolutely not. By statutory authority we can o­nly do — in terms of land use planning, and the plan commissions — we can o­nly do that if the communities allow us to do that. [CLARK] Well, I refer you back to s. 66.1001.1 sub B which says here that “the local governmental unit (which means you) can adopt, prepare, or amend a comprehensive plan”. It’s part of your duty to… ([CALLER: ED] If we could adopt… ) make the comprehensive plan consistent across your jurisdiction Sir. And you will do this. [CALLER: ED] We could do that as it relates to our plan. Now obviously, our plan, the county plan, will be at a less detailed level than the local plan. Quite obviously we’re not going to do that in a vacuum — if it’s done. Again, we have a strong partnership with our municipalities. And we think that they have a pretty good idea what’s going o­n in their own communities. And I don’t think there would be any support to do massive changes to what our citizens want. I mean after all they’re county citizens as well as town citizens. The towns are really an appropriate way to do the local planning. [MICHAEL] But o­nce you get into the stakeholder consensus gig… ([CALLER: ED] Okay, well you keep talking about this stakeholder consensus “gig”.) That is the tool that is universally used to advance these… ([CALLER: ED] Well, perhaps it’s universal to advance this… we’re not… we don’t have a “stakeholder gig” in our planning process). Then that’s what your citizens need to become aware of because what happens with those is that you get groups that have been funded with either tax-funded grants or are government employees who end up attending these meetings. Normally in our community we have so many meetings every night of these consensus… ([CALLER: ED] Yes… ) that I would have to be in six places and leave my kids behind ([CALLER: ED] Well sure.) and people simply don’t do that. So the problem is that when you start planning other peoples lives — “comprehensive control” I call it (Ed — mm-hmm) — we end up destroying the fabric of our society. And that’s what “Smart Growth”, Sustainable Development, Agenda21, Comprehensive Planning is all about. [CALLER: ED] Well, since we don’t have “stakeholder gigs” again I suggest that you probably don’t have a real good understanding of what we’re doing here. [MICHAEL] Well, I sure would like to communicate with you further because it is very easy for us to come up with the documented evidence of that in the state of Wisconsin anyway. Madison is a hub [source] for this stuff. [CALLER: ED] (chuckling) We’re not Madison! I think you could, I think you could… anybody that is listening knows that we’re not Madison. [PAT] I have to agree with Ed there ([CALLER: ED] laughs). Madison is kind of its own little country. [MICHAEL] Well, some of the communities in California, more in the rural areas are fighting this very hard and very effectively ([CALLER: ED] mm-hmm!). You know [they] say no comprehensive planning, [they] say no Agenda 21, and… you know… respect each others’ property and their use of the property ([CALLER: ED] mm-hmm). And that’s the kind of commitment to freedom that the rural areas like yours need to pick up o­n. [CALLER: ED] And I think there’s certainly a strong populace nature in Wisconsin and I think our citizens are all interested in public health, public safety. I don’t think anybody is raven for environmental degradation. I think the point of planning is to ensure that… to get people to understand where they want to go. To understand what their future needs to be. [MICHAEL] That’s a buzz word. “What our future… ” And the whole sustainable development movement is couched in terms for saving things for future generations. Well, that doesn’t make sense. ([CALLER: ED] Okay? (Chuckle) Tell me why?). I’ll tell you why. Suppose a hundred years ago people said “there’s not much whale oil. We can’t use whale oil, we can’t use lighting, because we need to use it for the next generation.” Well, my golly, if we hadn’t used whale oil people wouldn’t have been able to start reading at night, and expanding the potential for human capacity. And guess what? Sure there wasn’t enough whale oil, but we found fossil oil. ([CALLER: ED] mm- hmm). Now if we were to say the same thing about fossil oil — “we must save it for future generations” — there’s no need to do that. [CALLER: ED] Tell me how we’re going to create more land?! Welcome to the state of Gray Davis. [PAT] (Chuckle). Gray Davis isn’t Wisconsin yet is it? [PAT] All right. This is interesting though. Maybe I’m a normal person, but this really seems unbelievable. I can’t believe this stuff’s going o­n. [CALLER: ED] Well, I think that that healthy skepticism that you’re showing is rewarding. [PAT] I mean, could it be though that a higher level… a higher group is working through us without us knowing? (Ed laughs, Pat chuckles). You know what I mean? [MICHAEL] It’s easy Pat to verify that. I’ve got a [US] Department of Agriculture document here — [dated] 1995. The seeds for all of this were laid out at the federal level during the Clinton administration during the 1990’s. They’re now pulling the trigger and bringing it down to the local communities. And they’re doing it very, very fast. But in this document it says, “we will see all settlements (this is the UN term — human settlements… that’s “Smart Growth”) linked up by extensive bike (that’s in order to get us out of our cars in order to preserve for the future) and recreation and agro-forestry … “e-ways”… environmental ways such as in Madison, Wisconsin. We will find healthy productive soils (and it goes o­n to say) that have no rock dust (i.e. when we get rid of the roads)… ” Well you say “that’s crazy stuff!” Well it comes from the Department of Agriculture — U.S.
[CALLER: ED] Now tell me who the President is these days, and think if the President would tolerate such a thing. Think of the elected officials in Marathon County. Would they tolerate such a thing. Quite frankly I think it’s pretty absurd. [MICHAEL] I’m reading from federal government documents! I’ll give you another o­ne. The Department of Interior, Bureau of Land Management: it says that “in Eco-system Management… ([CALLER: ED] Okay, now… ) ([MICHAEL] let me finish) …Human beings are to be considered biological resources.”This is about collectivism! It is devious. It has fooled a lot of good people. And it needs to be stopped by the heart and souls of Americans! [PAT] And I think I know where Ed’s coming from. That he’s… we believe these terms are there and things of that nature. But why isn’t someone tooting the horn saying like “wait a minute folks, we’ve written some bad legislature!”? You know what I mean? Like Congressmen and things like that? [CLARK] Not o­nly have we written bad legislation, we haven’t bothered to debate it. In the case of Wisconsin we’ve gone ahead and enacted it and now have people running around saying that it’s mandated. Another point that I think we should look at pretty soon. [PAT] Okay. Well I tell you what, Ed I appreciate your calling in. I’ve got to break for news ([CALLER: ED] Absolutely). But thanks for your take o­n this. ([CALLER: ED] Sure enough. Good talking with you.). All right. Ed [ ], Marathon County planning. Hold o­n the line Michael. We have another hour, so we’ll take a break and come back. This is “Sound Off”.